There is something very Zen-like about doodling. You can do it anywhere with only a pen and a scrap of paper. However, lately I'm finding that I enjoy the art of zendoodles or zentangles. I learned about this type of art from an artist friend, Milliande. Her demonstrations of how to do it are inspiring! I used it with my art students at school and they soared! It is addictive! It's easy and fun. Just grab a couple PITT® Artist pens in a variety of sizes. I love the brush tip and the small tip for my doodles. I start with a shape. The wings were traced from a piece of Grungeboard (Tim Holtz). I then broke up the space inside with random lines. Next, you fill in the spaces with shapes, patterns (repeated shapes and lines), and areas of solid filled in color. I gravitate towards the zig zags, stripes, and natural shapes. Anything goes... there are no rules, but you do want to step back every once in awhile and check for balance. If it seems heavier or your eye moves to one side more, then fill in the opposing areas more. It is stunning against colored backgrounds. Often, I start with black and white and fill in around the design with the Aquarelle Art GRIP® pencils or Gelatos for a splash of color. You can see the one below has them in the center. I also enjoy doodling over patterned papers. It adds an additional element of pattern into the entire design. These pages are from my Sketchbook Project book. I found myself doodling when I didn't know what to do. It seemed to clear my artist block everytime!!! I recommend it when you find yourself stuck! Enjoy! Looking for some ideas on ways to use our fabulous PITT® Pastel Pencils? Check out this great video from Gina K at Stamp TV! Which is why I'm so excited about the new product line from Faber-Castell, DESIGN MEMORY CRAFT. Hi everyone, My name is Brenda Pinnick and I'm guest blogging today! This is just one of the pages in the minibook we'll be making. When I first heard about this new product line for crafting, all based on color, I knew I had to check it out! Those of you who know me, know that I'm all about beautiful color palettes! As a colorist for over 15 years and a lifelong professional artist, I can tell you that having color confidence in your creative work will open up all kinds of creative fun and will take away the fear of "messing up." One of my favorite things to remind artists in my classes and workshops is that using color is free. It doesn't cost you anything. Each hue is a tool in your tool box. Now that doesn't mean you should use all of them at once, but here, the color palettes are harmonious which means that you will end up with a project which offers both variety and harmony, two of the essential ingredients in making successful art pieces! The other wonderful advantage is that these products all work together as mixed media! I know you'll love using the new Faber-Castell Design Memory Craft products as much as I do. For the project above, I've used the following: Strathmore Vellum Bristol, Sizzix dies and Textured Impressions by Brenda Pinnick, (new lines, launching at CHA! ), Faber-Castell Design Memory Craft Mixed Media Sampler in blue. Hi! Jill here to share a technique that makes coloring images easy. On this card I used a heat embossed image and colored it using our Art GRIP® Aquarelle watercolor pencils. Because the image is heat embossed, if you go out of the lines you can just use a baby wipe to erase your boo-boo. :) And I just love how vibrant the color remains with these pencils, even after adding water. Alter a Canvas with Design Memory Craft Gelatos! Hi, Mou here with today's project... a layout on an 8"x10" canvas. Faber-Castell Design Memory Craft Supplies: Gelatos in various colors, Pastel Pencils, PITT® artist pens and Gesso (from the Textural Accents Sampler), blending stump or foam wedge (from the Essential Tool Kit); Other supplies include Helvetica 3" alphabet stencils, buttons, photo, pencil, and adhesive. Trace the letters A,B and C along the left edge of the canvas with pencil. Rub Gelatos in your chosen colors around the traced letters. Blend in using foam wedge or blending stump. Keep adding and blending colors till you are satisfied with the layered coloring. Color in a rectangle to the right of the ABC block to create a visual matte for the photo. Attach photo and using gelato color around the photo. Blend the colors with white gesso. Doodle in details and mute the details somewhat with a thin layer of gesso. Add the title and journaling with PITT® Artist pens. Add more color by filling in parts of the handwritten title and journaling. Add buttons in layers above the photo to finish the canvas. Stamp, Emboss, Color and Cut. That's all there is to this bright, fun, and cheery flower arrangement and what's even better than that is that it is so fun and simple to create. Hello everyone, it's Christine here, ready to share the process of how I created the card below. Stamp: Take your favorite stamp and ink it up with your favorite black pigment inkpad, or a black Stamper's Big Brush! Stamp it on white paper. Emboss: Sprinkle ink with clear embossing powder and heat until shiny. This will give you a raised line which will gives dimension and pop to your image. Color: Color the entire flower with the lightest color first. I used the Faber-Castell Stampers Big Brush color Pink Madder Lake #129. Then I used a darker red, Deep Scarlet #219, to create a shadow on each part of the petal. I repeated the process with the yellow flowers using Cream #102 and Cad Yellow #107. Cut: Cut out each flower and arrange on your card adhering them to card base with pop dots. Extra: The last element is the bunch of leaves which were diecutted from patterned paper. Then to create a more cohesive look I used a black PITT® Artist Pen to doodle an outline around the shape of the leaves. I also stamped and embossed the hello sentiment. Jen Matott here to share with you some pages from a journal that I just completed. It's a moleskin from The Sketchbook Project. If you aren't familiar with The Sketchbook Project, it's a traveling art exhibit that has close to 30,000 artist's sketchbooks (all the same size) with varying themes. Artists can choose their own from a list or have the ArtHouse randomly choose one for them. Today, I'm going to share with you a couple of pages of my sketchbook that I used the Design Memory Create products on. First up is the cover of my book. I used Gelatos exclusively here and want to show you the technique that I used. It's actually really simple, but kind of messy! Get some paper towels, a rag or an easy to clean surface ready! I'm a BIG fan of drips and splatters. I can't seem to start a page without mucking it up first. That plain white (or Kraft) in this case just intimidates me and to tackle my fear of perfection, I make a mess first. Once it's "messed up", I feel like I can do anything on it! Okay, now grab a black, metallic blue, and white Gelato stick. Now, apply some random metallic marks. Add more at the top of the page. If you want the look to be more metallic blue drips, then add more blue than white or black, but keep it towards the top. Next, add a line of black at the top of the page and use a brush to help blend some of the original marks lightly. A bit like whitewashing. I'm not careful and I leave the top of the paper alone! Just smearing and watering it down a bit. You can let that dry. Take a spray bottle (I use one I got from the travel section of Target) and lightly mist the top part of the page. Hold the page vertical while misting and allow the drips to flow! Keep misting until you get the drips you want. You can also tap it on the table to encourage more dripping. Just keep a towel or rag under it or work on a non-staining surface. When you are satisfied, allow to dry or use a heat gun to speed up the drying. *** I recommend you use a thick paper substrate like watercolor paper or thick cardstock that can withstand being wet. You can use any combination of colors and add a metallic to the mix to create shimmery effects. Design Memory Craft Gelatos are my new favorite material! Thanks for playing along! I'll be back another day to share another technique with you soon! Hello All! This is Colleen McGinty checking in for the first time. I work at Faber-Castell in product development and I love, love, love my job! I have had so much fun working on Design Memory Craft. Supplies: Faber-Castell Gelato, silver & gold, Faber-Castell Stamper's Big Brush, black, Faber-Castell, Leaf Stamp. Other supplies: mini easel, 3x3 inch canvas, scrapbook paper scraps, feathers, buttons, ribbons, rhinstones, small exchange pictures, adhesive. * Glue the scrapbook paper to the canvas, trim the edges. * Color the scrapbook paper with your gelato of choice. * Smooth the gelato color with water misted on a soft cloth. * Color the stamp with the PITT® Pen Big Brush & stamp the edges of the canavs. * Apply your photo and extras and display on the mini easels. Have more fun with minis! Make some for each season! I look forward to meeting all of you at CHA in just a couple of weeks! After coloring the damask background directly on the stamp with Stampers Big Brush Pens in red, yellow, and green, I stamped onto white cardstock. I added shading to the stamped background using PITT® Artist Pens--perfect for tiny details! Finally, I used Art GRIP® Aquarelle Watercolor Pencils to create a light yellow watercolor background. I love that these markers are india ink which is waterproof, making it easy to add a wash of color AFTER you stamp. The possiblities are limitless! Hi all! Rita Barakat here and I am so excited to be a part of the Faber-Castell Design team! This is one of my favorite layouts. That is my youngest daughter and I wanted to make something magical for the photo. I had just gotten my Design Memory Craft goodies from Faber Castell and I had to find a way to try them all, and this is what I came up with! LOL! 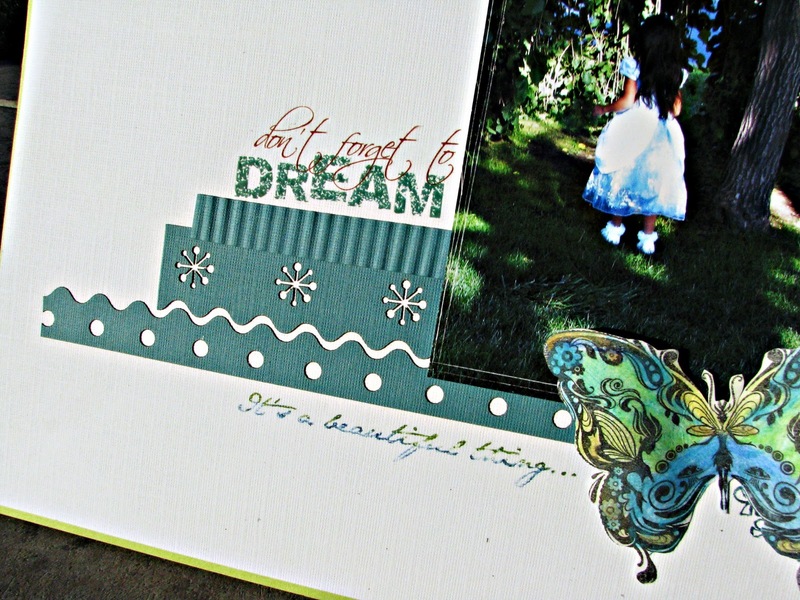 Butterfly on the top left hand corner was made by embossing and stamping a piece of paper with the butterfly stamp. Coloring it in with the Gelatos and rubbing it in with my finger until the colors blended together. I wiped off any excess off of the black. Cut it out. Butterfly on the right was made just like the one above but instead of rubbing the color I scrapped off the top layer, misted it with water and cut it out. Butterfly below was made by stamping the image with waterproof ink and coloring in the image with the Aquarelle watercolor pencils. I misted the image and blended the colors with a Qtip. I used the Big Brush Artist pens in blue and green to color the vines, phrase and floral stamp. On the page itself, I stamped directly onto the paper. I cut the die cut paper into strips and placed them as in the picture. One of the strips I put through a crimper. I used an awl to scrape the photo and adhered it to the page. I placed the rub-on directly on the page.